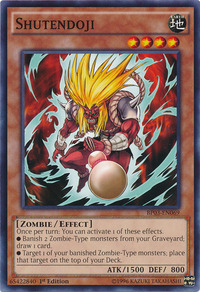 ● Banish 2 Zombie-Type monsters from your Graveyard; draw 1 card. ● Target 1 of your banished Zombie-Type monsters; place that target on the top of your Deck. Shuten-dōji is an infamous princess-kidnapping, bloodthirsty Oni from Japanese folklore. Its name literally means the one who drinks wine. Shutendoji is holding a bottle of rice wine (sake). Removing from play 2 Zombie-Type monsters in your Graveyard is a cost. Removing from play two Zombie-Type monster is a cost to activate the drawing effect. : Effect Monster > Shutendoji: Are the two Zombie-Type monsters removed from play by "Shutendoji" a cost to activate the drawing effect? The effect which returns one removed from play Zombie-Type monster to the top of your Deck targets the Zombie-Type monster.